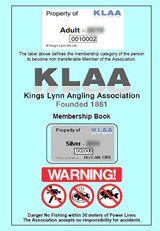 Kings Lynn Angling Association, founded in 1881 supports local anglers as well as many visiting anglers to the West Norfolk area, on a Non commercial basis. It’s main objective from its constitution reads: “The objectives of the Association shall be to provide the facilities of angling for it’s members, including organization and the provision of angling and to promote the interests of angling and anglers”. 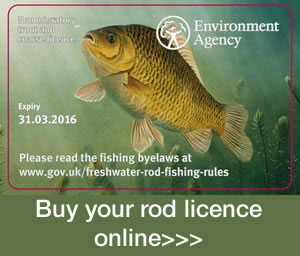 The Association both owns a number of fisheries and leases the rest from a variety of organisations and landowners. These include fen drains, Middle Level, Old Bedford, Rivers like the Great Ouse, in sections along Ten Mile Bank, the Relief Channel and Cut Off Channel. Key access points and well known venues can be accessed at Downham market, Denver Sluice, Three Holes, Magdalen Bridge and many more locations across West Norfolk. Also the Association owns and leases stillwater / gravel pits, Tottenhill Pits, Springside and Shepherds Port at Snettisham on the North Norfolk coast, two of these are leased from The Sandringham and Ken Hill Estates. These are run in a partnership with RSPB and are a wildlife haven. All the fisheries offer a wide range of species that include, bream, carp, roach, perch, pike, tench and zander and offer pleasure anglers, match anglers and specialist anglers with an opportunity to catch both quantity and quality. The middle Level having been a venue that has produced a record zander. The fisheries are run on both open season ticket and day ticket basis, with some being by season ticket only. So if you as a visitor are a carp angler, a pike angler a match angler or purely a pleasure angler then Kings Lynn Angling Association has plenty to offer, at reasonable prices and in beautiful locations. 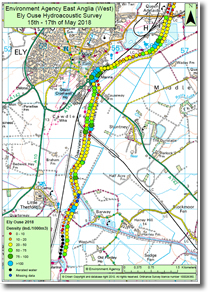 The latest Ely Ouse acoustic map is now available. The fish seemed to still be shoaled up, perhaps the changeable and cool weather to date is responsible.